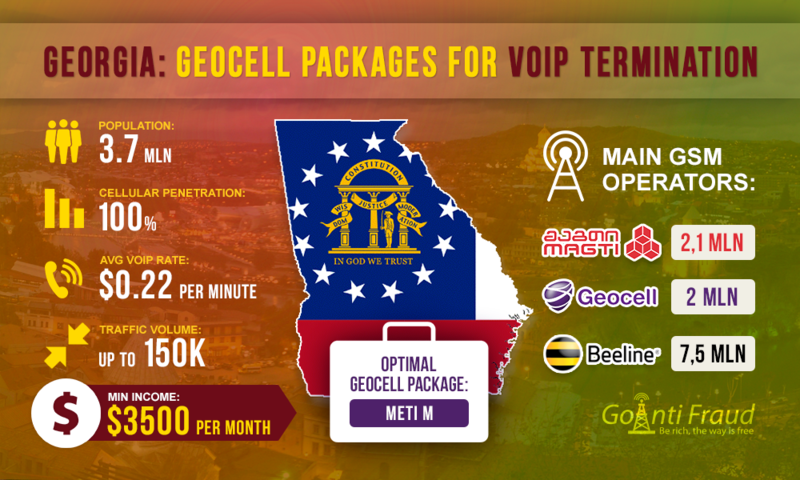 Geocell is one of the largest GSM-operators in Georgia, providing 98% coverage across the country. The company offers customers a wide range of services and 10 tariff plans, among which are the most suitable for you to choose from. It is not that simple to understand all the details of the proposed packages, because the operator provides different conditions and bonus systems for each of them. Terminators, as always, ask the question: which Geocell plan is most profitable to terminate international calls? The optimal package for the termination is “Meti M”. A minute costs from $0.004. You need to pay $4.37 to connect to it. The following two packages, Tariff 1-12 and Tariff 1-10, can be put on a par with the best offers for a successful call termination business. A minute of the call will cost $0.004373. All the packages do not provide additional charges for calls within the network. However, in order to use them, it is important to activate a Geocell number until the end of the month. Otherwise, a minute of conversation will cost much more expensive. In addition, Tariff 1-12 and Tariff 1-10 require an additional activation. To activate Tariff 1-12, you need to dial * 122 * 1 # OK, Tariff 1-10 - *011 # OK.
Today, special tariff plans for smartphones, involving an unlimited number of calls and unlimited Internet, become more and more popular among the users. The prepaid packages Meti Unlimited + and Meti Unlimited cost $21.86 and $10.93 per month, respectively, with one minute of conversation to be $0.025- $0.13, which is significantly more expensive than the tariff plans discussed above. However, Meti Unlimited + and Meti Unlimited are also used in the GSM termination system Georgia. At the same time, to make calls, residents and tourists connected Tariff 12 tetri. Its trick is that all the directions in Georgia ill cost as little as $0.05 per minute. Besides, the package can also be used for active communication. All other packages - Meti S, Tariff Nulomani, Tariff Globusi are not suitable for termination because of an insufficient number of minutes in the network, the high cost of packages, and inappropriate connection. By selecting the appropriate tariff plan, terminators can make $3,500 and more in Georgia. However, remember the operator AntiFraud system can be a major obstacle on the path to high earnings, completely blocking the SIM-cards. To prevent this problem, be sure to connect your equipment to GoAntiFraud and use simulation tools of human behavior on the network. With it, you can improve the performance of GSM gateways and increase VoIP termination revenue many times.